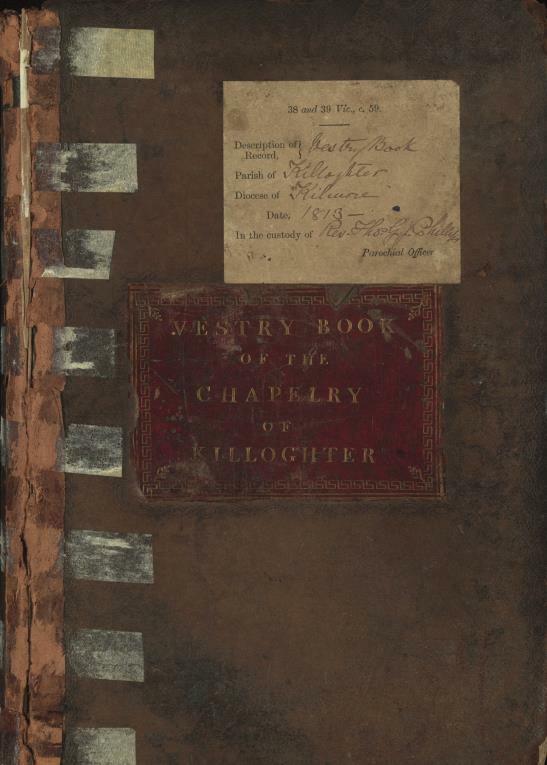 For historians and others interested in the Church of Ireland and its relevance for local history who have ever wondered ‘What is a vestry book?’ the answer is to be found in a colourful online presentation at the RCB Library’s Archive of the Month slot on the Church of Ireland website. Vestry minute books record the civil and religious activities of the parish, the administrative decisions of the vestry, and details of those responsible for taking those decisions. Alongside parish registers of baptisms, marriages and burials, these sources form an important and significant component of the records of the Church of Ireland. In the current presentation, a case study of the earliest vestry minute book for the parish of Killoughter (located in north Cavan close to the village of Redhills) provides a unique record of the origins, development and concerns of this rural parish in the diocese of Kilmore, from its establishment in 1813 up to 1916. The vestry book actually runs all the way up to 1972, but for the purposes of the online presentation the content up to 1916 is available for perusal to a worldwide audience. 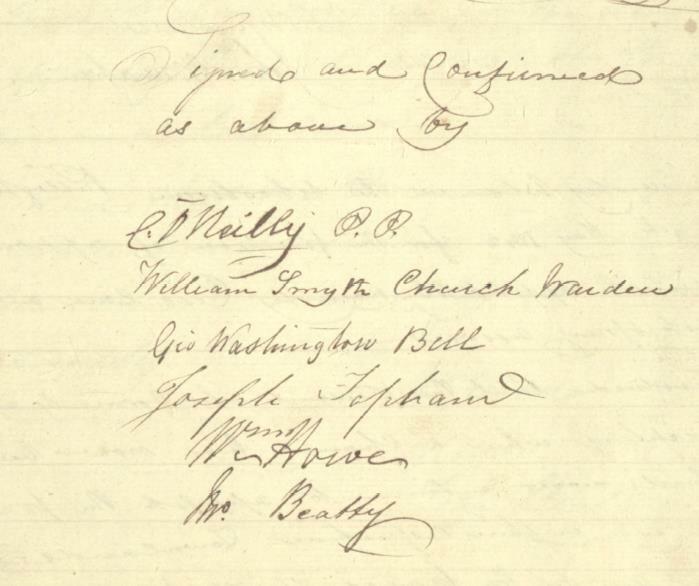 The records of the vestry meetings include the names of those who held the principal vestry offices. The minutes were usually signed by the clergy, who traditionally chaired the meetings, and in some instances by the churchwardens or other members of the vestry who had attended the meeting. Frequently the addresses of these individuals are included in the records and such information proves invaluable for genealogists as they attempt to connect people and places. The volume covers a range of issues relevant to the Church and the wider socio–economic structures of rural Cavan society during the 19th century. It includes exploration of the unpopular parish cess – the tax levied on the occupants of the parish, regardless of their religious denomination, and which was particularly resented by local Roman Catholics and Presbyterians who gained no benefits in paying it. Conversely, an entry dated from 1814 reveals that the rector and churchwardens agreed to subscribing ‘towards the Roman Catholic Chapel’ and support for its repair in the 1830s and 1840s, small ecumenical gestures that may likely have fostered good local relationships. Indeed in May 1841 it was one ‘C O’Reilly PP’ (Charles O’Reilly, Parish Priest of Annagh East from 1830 to 1842) who signed the record of the meeting which recorded the names of the individuals from the townlands within the parish, and several of those which bordered it, who had been nominated to collect the county cess in each townland. These stories and more are brought to life by the online exhibition which has been researched and written by Dr Jonathan Cherry, a lecturer in Geography at the School of History and Geography, Dublin City University (DCU), and historical geographer.